Two people suffered minor injuries and 16 people were displaced Monday morning when a fire broke out at a Lakeside apartment complex. 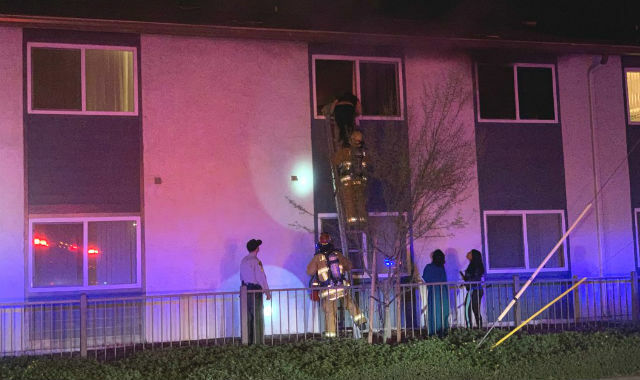 The fire broke out around 3:40 a.m. at an apartment complex near the intersection of Mapleview and Ashwood streets, Lakeside Fire Protection District Division Chief John Hisaw said. Firefighters arrived and found thick black smoke and flames coming from a second-floor unit in the 12-unit apartment complex, Hisaw said. Crews also found a woman hanging from the apartment unit’s back window and used a ladder to rescue her, Hisaw said. The fire had started toward the front of the unit and the woman was apparently attempting to escape out the back window, he said. Firefighters knocked down the flames in around 15 minutes, Hisaw said, adding that two patients were transported to a hospital with minor injuries. The blaze damaged six apartment units and the American Red Cross was called in to help 16 people and two dogs arrange for alternate lodging, the division chief said.